Received: December 1, 2018; Accepted: December 18, 2018; Published online: December 30, 2018. Hypertrophic scars are defined as visible and elevated scars that do not spread into the surrounding tissues and often regress spontaneously. They can be itchy, painful, and erythematous, so it is a challenging problem for doctors to manage them. This is because hypertrophic scars are caused by the proliferation of dermal tissue and the excessive accumulation of collagen, long-lasting inflammation, and fibrosis. Triamcinolone acetonide was used because it reduces the collagen and inflammatory process. A fractional laser was also used to flatten the overgrown tissues. Four patients who were treated with triamcinolone acetonide and fractional laser to treat a hypertrophic scar were included retrospectively. All patients were injected with triamcinolone acetonide and fractional laser simultaneously. The results were evaluated every session using the Vancouver Scar scale (VSS) and all patients were asked to express a 4-point subjective scale of satisfaction. Measuring the wound with photographs, the VSS score showed improvement over time. The average VSS score of pretreatment and posttreatment was 12 and 4, respectively. The average number of treatments was 12.75, and the average interval of treatments was 5. Using a patient satisfaction scale, the patients were satisfied (Poor: 0%, Fair: 25%, Good: 50%, Excellent: 25%). No significant adverse effects and complications were encountered. The simultaneous treatment using triamcinolone acetonide and fractional laser can be an effective treatment modality for treating hypertrophic scars. In recent years, the combined treatment of conventional methods shows good results. For example, Manuskiatti and Fitzpatrick found clinical improvement of hypertrophic scars after treatment with an intralesional injection of triamcinolone acetonide combined with ContractubexH gel, which appears to be superior to intralesional triamcinolone administered alone in the treatment with no significant side effects.2 Khan et al.5 demonstrate that combined treatment of intralesional traimcinolone with 5-fluorouracil is more effective and gives rapid response with fewer side effects. Although combination therapy may result in synergistic effects, the studies on this issue are not enough. In this study we wound like to introduce about usefulness of combination treatment of triamcinolone acetonide and ablative fractional laser for hypertrophic scar. The 4 patients who were visiting our plastic and reconstructive surgery department during 2013–2018 were enrolled in the study, and patients developed hypertrophic scars due to trauma, burn and surgical procedure. Patients who had previously received other treatments for hypertrophic scar, who had less than 1 year of hypertrophic scar formation or who are currently taking steroid drugs are excluded. Each patient received combined treatment of intralesional triamcinolone acetonide and fractional laser for hypertrophic scar. To minimize pain, topical anesthetic cream (eutectic mixture of lidocaine and prilocaine; EMLA® cream 5%, Astra Zeneca, Sweden) was applied under an occlusive dressing for at least 1 hour. The injection was conducted using 27 gauge needle intradermally and concentration of triamcinolone acetonide (10–40 mg/ml) was determined by the location and thickness of the scar. Consecutively, Fractional CO2 laser (LineXel®; UTI Co. Ltd, Seoul, Korea), the pulse duration of 260–400 ms, with a distance between spots of 0.85–0.9 mm, and spot size of 1 mm was conducted. Settings were customerized for each patient at each treatment session according to scar thickness. Clinical photographs were taken to evaluate patient satisfaction and objective improvement in every session. Photographs (Nikon D90; Nikon Corp., Tokyo, Japan) were taken under identical settings at baseline evaluation, every treatment visit (before and after session) and 1 month after the last session. Results were evaluated every session using Vancouver Scar scale by experienced independent physician and all patients were asked to express a 4-point subjective scale of satisfaction (Poor: 1, Fair: 2, Good: 3, Exellent: 4). All of the participants were women and mean age was 33.25 (range from 10 to 51). The average number of treatments was 12.75, and the average interval of treatments was 4 weeks. Most patients were satisfied with their appearance after the final session (Table 1). Measuring the wound with photographs, Vancouver Scar scale shows improvement over time. The average score of pretreatment was 12, but in 1 month after the last session, the score was decreased to 4 (Fig. 1, 2). Particularly, in pliability and scar height section, a decrease in score was observed evidently (Table 2). There are no significant side effects and complication. The most frequent side effect was transient erythema. It occured in 2 of 4 patients, lasted for 2–3 days and all patients completely healed within 3 days spontaneously. In this study, we tried to investigate the interaction between existing treatment, and verify its safety. The results of our series indicate that combination same-session therapy with laser and laser-assisted delivery of triamcinolone acetonide offers efficient, safe, and effective treatment of challenging hypertrophic scars. The limitation of our study is that the number of enrolled patients is small that diversity is not secured and could not evaluate the result accurately. Also, the lack of comparison with control group is another limitation. 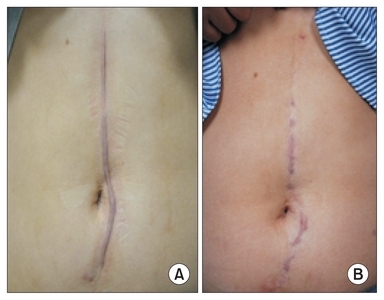 Despite of the effort to quantify scar assessments such as using the Vancouver scar scale, The evaluation itself was subjective and failed to provide an objective evaluation. Among the many methods of hypertrophic scar, combination treatment of triamcinolone acetonide & ablative fractional laser for hypertrophic scar can be useful method. In the future, we shound carry out more generalized research by conducting research on more patients. Fig. 2. Photographs of a 41-year-old female prior to treatment (A). After 15 session of treatment (B). Berman, B, Maderal, A, and Raphael, B (2017). Keloids and hypertrophic scars: pathophysiology, classification, and treatment. Dermatol Surg. 43, S3-18. Rabello, FB, Souza, CD, and Farina, JA (2014). Update on hypertrophic scar treatment. Clinics (Sao Paulo). 69, 565-73. Waibel, JS, Wulkan, AJ, and Shumaker, PR (2013). 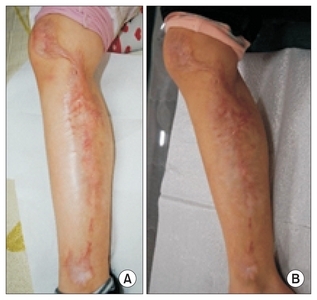 Treatment of hypertrophic scars using laser and laser assisted corticosteroid delivery. Lasers Surg Med. 45, 135-40. Khan, MA, Bashir, MM, and Khan, FA (2014). Intralesional triamcinolone alone and in combination with 5-fluorouracil for the treatment of keloid and hypertrophic scars. J Pak Med Assoc. 64, 1003-7. Hultman, CS, Edkins, RE, Wu, C, Calvert, CT, and Cairns, BA (2013). Prospective, before-after cohort study to assess the efficacy of laser therapy on hypertrophic burn scars. Ann Plast Surg. 70, 521-6. Rockwell, WB, Cohen, IK, and Ehrlich, HP (1989). Keloid and hypertrophic scars: a comprehensive review. Plast Reconstr Surg. 84, 827-37.